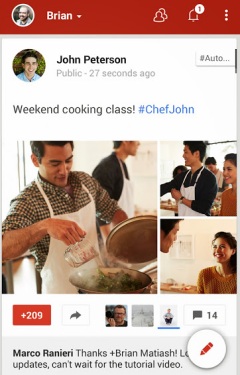 Google+ Photos added a new feature called Stories. 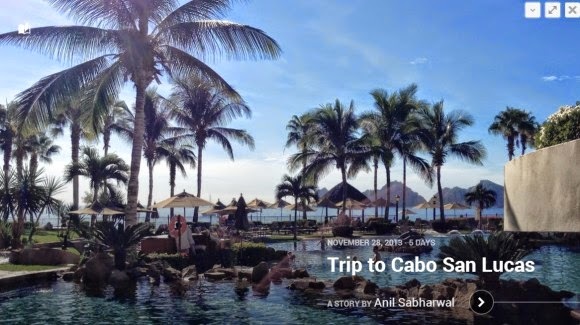 Google automatically groups some of your best photos and videos, based on the date and the place where they were taken, and creates animated stories you can edit and share with other people. 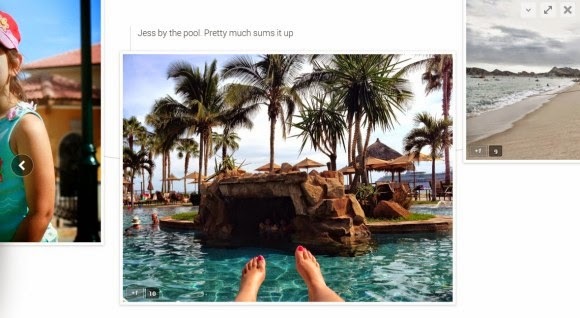 "Google+ Stories can automatically weave your photos, videos and the places you visited into a beautiful travelogue. No more sifting through photos for your best shots, racking your brain for the sights you saw, or letting your videos collect virtual dust. We'll just gift you a story after you get home. This way you can relive your favorite moments, share them with others, and remember why you traveled in the first place," explains Google. 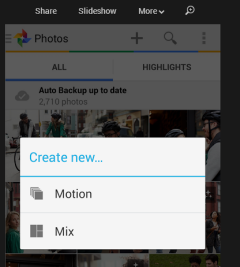 To find all the stories generated from your photos, go to Google+ Photos, click "More" next to "All photos" and select "Stories". They have pretty accurate titles like: "Friday afternoon in Istanbul", "Trip to Paris", "Weekend in Belfast". * Auto Awesome Movies are now available on Android, iOS and the web, so lots more people will receive highlight reels of their photos and videos. * You can now browse your entire photo library, as well as your highlights, by date. Just drag the new scroll bar to move forwards or backwards in time. * Really big photo libraries are now supported on Android, so you can access your many thousands of photos quickly and easily. * A new navigation menu makes it easier to switch between your favorite circles and communities, as well as other places in the app. * It's a lot easier to share content from your phone or tablet. To give it a try, just tap the new pencil icon at the bottom right of the stream. * The app menu now slides away as you move down the stream, letting posts fill the entire screen. When you use Gmail's "insert invitation" button, you get this message: "Starting July 2014, this feature will no longer be available. 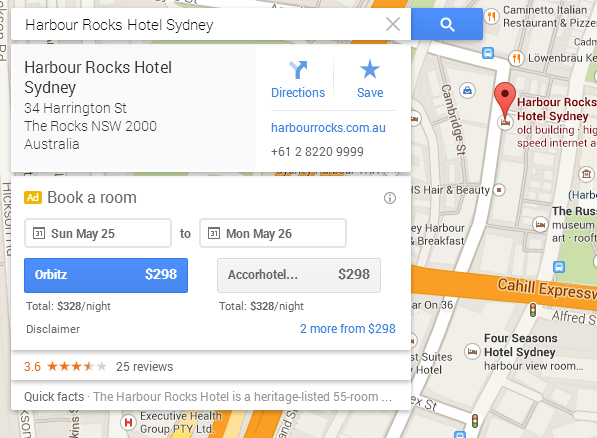 You can continue sending email invitations from Google Calendar." Probably this feature wasn't used very often, but a small percentage of Gmail users will miss it, especially business users. Adding invitations from Gmail is more convenient than opening Google Calendar in a new tab, creating a new event and inviting guests. "It (truly!) is always tough choosing which features to continue to support. We make these decisions carefully, so please know that! We'll still be supporting creating invitations, just through different steps. 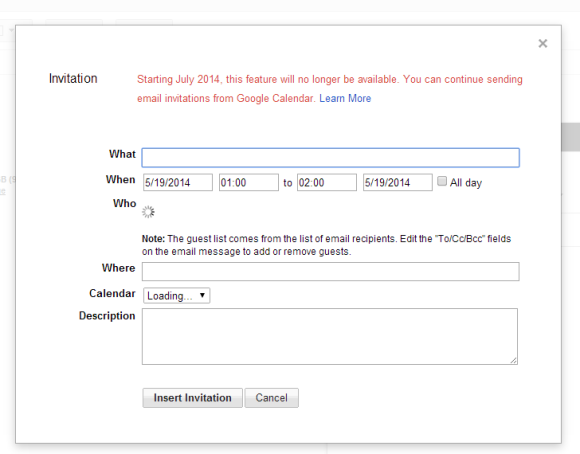 The workaround now is to click into calendar and to create an invitation from there," inform Gmail Community Managers. 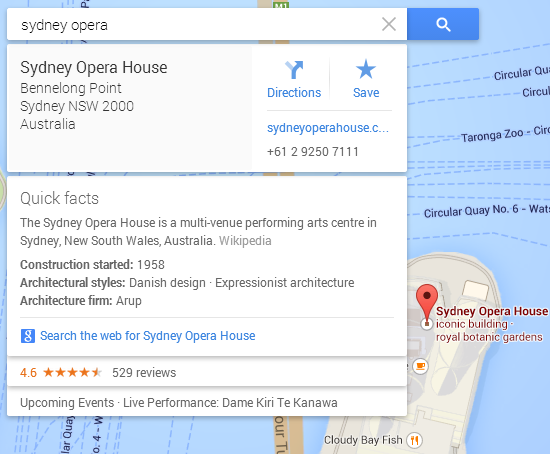 When Google added site info cards for search results, I noticed that Google only used information from Wikipedia. If a site or an organization didn't have an associated Wikipedia article, the info card wasn't displayed. Now Google also uses descriptions from the Open Directory Project (DMOZ), so sites like the Official Google Blog, Android Police or this blog got their own cards. YouTube has a page that lets you switch to the HTML5 player. If you visit that page in Chrome, you'll only see the message: "The HTML5 player is currently used when possible" and you can't switch to the Flash player. In all the other browsers, the Flash player is enabled by default and you can click "request the HTML5 player" to enable that player. It turns out that the HTML5 player is now enabled by default in Chrome and it's the only player you can use, at least officially. YouTube's HTML5 player now supports all the features of the Flash player, including ads and encrypted streams. If you don't like the HTML5 player and you want to switch to the Flash player, install this extension. 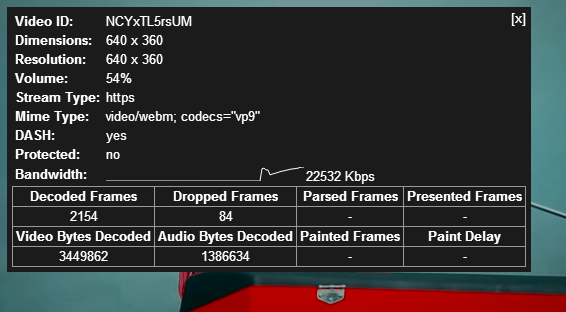 YouTube's HTML5 player has recently added bandwidth stats. Just right click the player and select "stats for nerds". It's fairly easy to tell if you're using the HTML5 player or the Flash player: if you see a menu item called "about the HTML5 player" you're obviously using the HTML5 player. 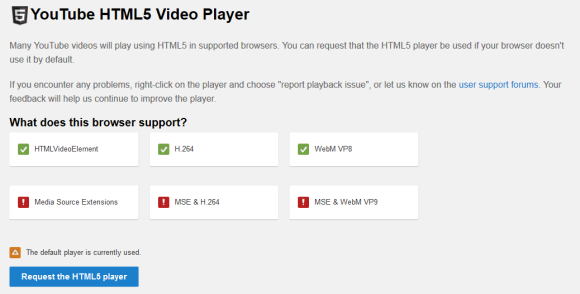 Go to YouTube's HTML5 video page and click "Request the HTML5 player" to enable it for most videos. "In computer networking and computer science, bandwidth, network bandwidth, data bandwidth, or digital bandwidth is a measurement of bit-rate of available or consumed data communication resources expressed in bits per second or multiples of it," informs Wikipedia. Bandwidth stats are only displayed in Chrome and they're probably related to the DASH support. YouTube uses adaptive streaming, so that you get the most appropriate video quality for your bandwidth, even if it fluctuates. Google also has a video quality report page, which shows information about YouTube streaming, including some stats for each major ISP in your area. YouTube used to offer a speed test service, but this is no longer available. 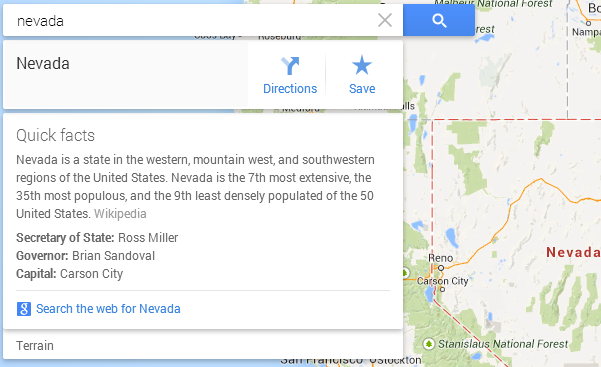 Google Maps for desktop added a "quick facts" card that uses information from the Knowledge Graph. If you search for a country, a state, a city, a district, a museum or any other important building, you'll find some information from Wikipedia. 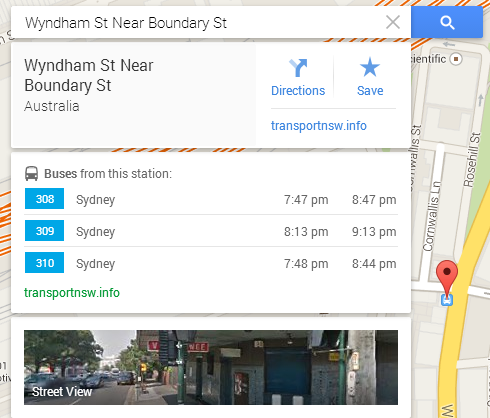 Google Maps cards include a lot of useful information, depending on the context: events, transit information, hotel booking. One of the most annoying things about Chrome Web Store was that it didn't work if you used a mobile phone or a tablet. 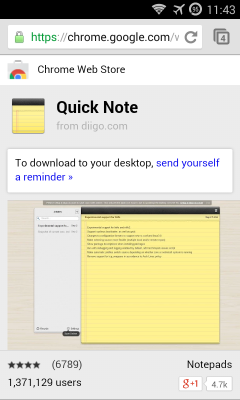 Google only displayed a message that allowed you to send a reminder to download the app or extension from the desktop Chrome. Chrome Web Store now has a mobile interface, but only for individual apps and extensions. The homepage, category pages and the search feature still aren't available. If you find a link to a Chrome app or extension, you can now open it in your favorite mobile browsers, read the description, check the screenshots and some other details. You can't read or write reviews, install extensions remotely, find related extensions, go to the homepage or to a category. 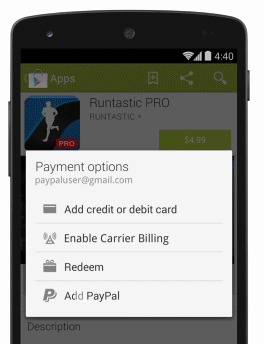 Google Play added support for a very popular payment service: PayPal. "We're making it possible for people to choose PayPal for their Google Play purchases in 12 countries, including the U.S., Germany, and Canada. When you make a purchase on Google Play in these countries, you'll find PayPal as an option in your Google Wallet; just enter your PayPal account login and you'll easily be able to make purchases," informs Google. Here's the full list of countries where PayPal is now supported: Austria, Belgium, Canada, Finland, France, Germany, Ireland, Italy, Netherlands, Spain, United States, United Kingdom. One important notice: "PayPal can't be used to purchase devices or accessories on Google Play or for other purchases that use Google Wallet outside of the Play Store." Google has always tried to promote its own payment service, whether it was called Google Checkout or Google Wallet, so why would Google add support for a competing service? Google offers an answer: "Sales of apps and games on Google Play are up by more than 300 percent over the past year. And today, two-thirds of Google Play purchases happen outside of the United States, with international sales continuing to climb. We're hoping to fuel this momentum by making Google Play payments easier and more convenient for people around the world." In addition to supporting PayPal, Google also added carrier billing to 7 more countries (including Singapore, Thailand and Taiwan) and Google Play gift cards to 13 more countries (including Japan and Germany). "Developers based in 13 new countries can now sell apps on Google Play (with new additions such as Indonesia, Malaysia and Turkey), bringing the total to 45 countries with support for local developers."